Mr Papafakis: Logan's world, Helsreach. Helsreach, the largest settlement on Logan's world. Here, "you will never find a more wretched hive of scum and villainy"........well, that's what it says in the brochure anyway. I've always loved the illustrations within RT, and among them, some of the most inspiring to my mind were the one's devoted to Logan's World. 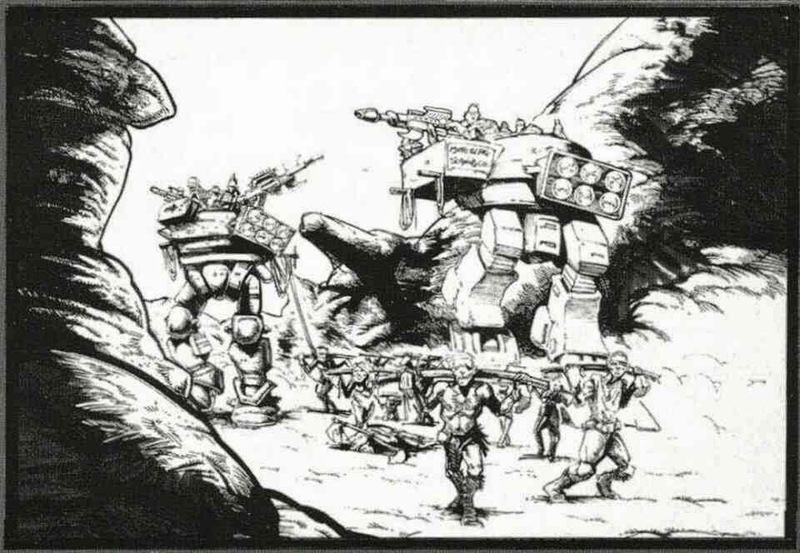 Specifically the one showing the slavers striding across the barren landscape in their giant Mech walkers. Based on a Battletech, come Robotech, come Mechwarrior.....ahhh forget it! It's just a generic robot thing ok! Amongst the many and varied ideas I've had for creating vehicles to game with, this one has remained relatively easy to accomplish (It just took me over twenty years to get around to starting it, that's all). 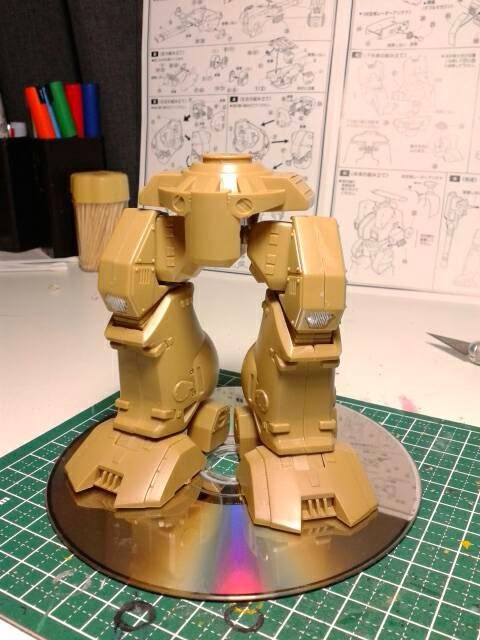 It's based off a Macross 1/72 scale Destroid kit from Ban Dai. I've put the lower half of him together already, now I've just gotta figure out how I'm gunna go about constructing the howdah. Plus, adding all the accoutrements that a "well to do" slaver would need to ply his nasty trade with. Mounted on a DVD that shocked me with its mediocrity. So as you can see, there's still quite a lot to be done. Good idea and great start. Ta, I'm about half way through building the howdah. BTW, “WFB” has an amusing meaning in the Urban Dictionary, LMAO (so to speak). I look forward to seeing some good posts from you. I've been following your blog for a while now, always like your articles on the strange and esoteric. It's quite a task trying to find worthwhile content on the net, but you sir, have definitely piqued my interest. 89 seems to have been a good year for introduction's into gaming. "Games 89" in Melbourne, Australia, was a games expo that I attended with a friend from school. I'm sure it wasn't the first time I had seen miniatures, but it was certainly the first time I had been to a convention. The memories are still vivid after all those years. I can remember seeing daleks fighting down cardboard corridors, an model AT-AT sporting an ork on its roof hiding behind sandbags. It was also the first roleplaying game I had been to, outside of close friends. I never got into the tournament's scene. I was -and still are- quite content to play with close friends. Thanks for the good wishes CoastConFan. Keep up the good work. Great project, I was just thinking about these for the Adeptus Mech and your blog popped right up. I finished the Walker about a year ago now?....l think? Since then I've done a Siege Dreadnought, a Grav attack tank and now I'm half way through another Siege Dreadnought. I've got four of these guys to do! Ultramarine's, hut hut hut hut!! !